So this is done now and thanks to Mark in Norman 2 for shaming me into DIYing it. I have this weird inverted layer cake of a ceiling in my living room. It’s definitely memorable, but also definitely too high to reach entirely with a ladder. Last time I tried to paint a ceiling I had to look up “removing stains from your luxury rug” on Google so I needed this time to go better! Here’s what I was able to do it using just my 8′ ladder. In case it’s unclear what’s going on, we’re trying to get rid of the yellow. Anyway, getting the job actually done required me to rent scaffolding. I went to the rental place just down Highway 9 from here and told the guy I needed scaffolding high enough to reach a 15-foot ceiling (it’s probably more like 14 feet, but whatever). He then got me set up with a bunch of scaffolding that we stuffed into the bed of ol’ Epimetheus. 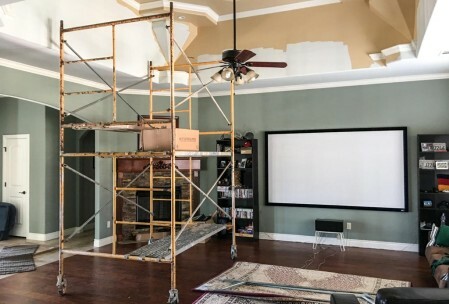 If that looks like a lot of scaffolding, well — it turns out that when I told the guy that I needed to paint a 15-foot ceiling, he figured he needed to rent me enough scaffolding so that I could stand 15 feet above the ground. 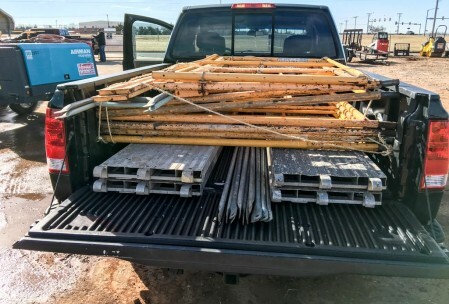 Once I got it all home and after watching the first four minutes of a YouTube video on how to assemble scaffolding, I assembled the scaffolding. It took maybe 20 minutes. When I was done it looked like this. There were still another four yellow things that I didn’t use. Plus a bunch of safety restraints, which — I’m not sure how you put up enough scaffolding AND safety restraints AND stay below a ceiling if you use the safety restraints. Long story short, I never did fall off the scaffolding. It was actually kind of fun climbing up the scaffolding and doing the painting. A little bit of a hassle having to maneuver it around the ceiling fan, although it turns out the ceiling fan can be pushed around a lot. 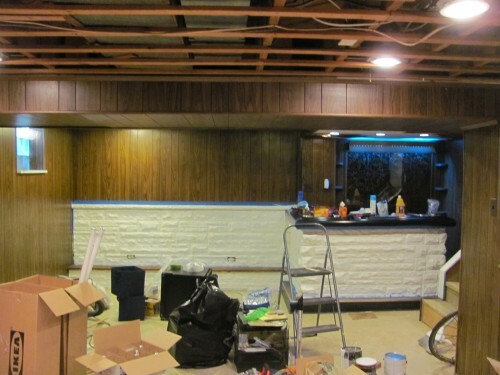 Once completed, I had a living room ceiling that looked like this. I then disassembled the scaffolding, took it back to the rental place, and was able to live happily ever after. I’ll do a separate post about the long, arduous process. There was a lot involved. 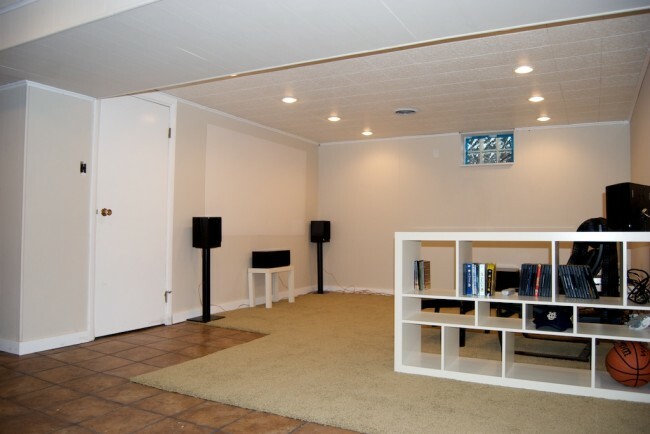 The basement deserves two posts. At least two posts. Here’s one. The main difference being that I turned the lights on. And that there were lights that could be turned on. And a ceiling. 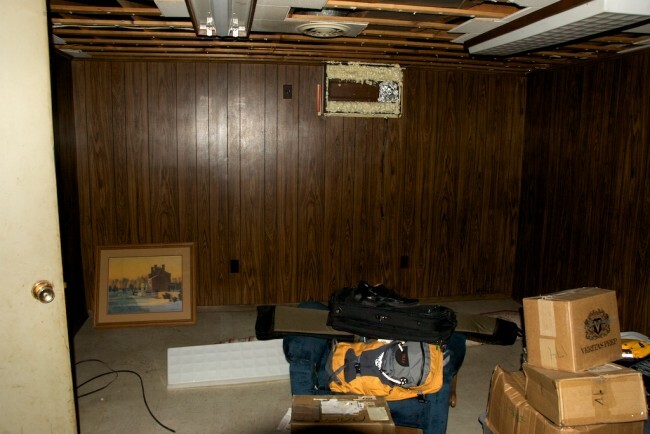 The before photo does a poor job of showing that there was, in fact, no ceiling. At least this side of the room makes the ceiling situation more obvious. The fluorescent fixtures didn’t totally work. Occasionally they would work, though usually only one at a time. They were vexing, then they were eliminated. Let that be a warning to future light fixtures. And, yes, I know there’s still blue tape on the window. More details in another post probably. 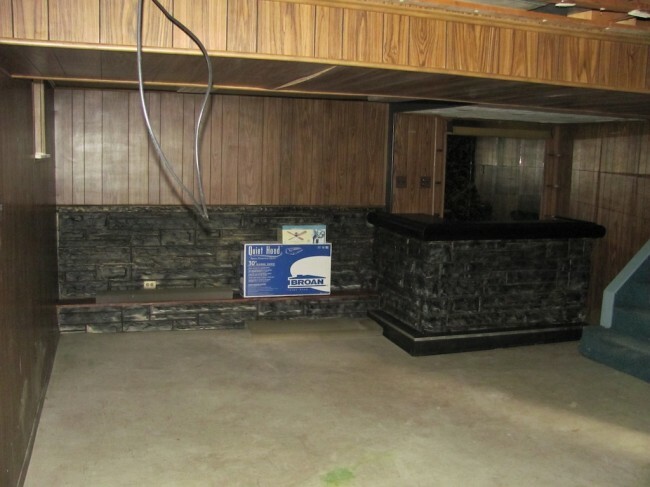 The basement was finished some time in the 1960s. I take it that odd things were in vogue in that time period. Plastic, for instance, was a miraculous victory of man over nature. Similar to TV dinners I imagine. It was pretty classy. He did a faux finish with gold and black. He used spray paint. It was pretty classy. The Ikea box really dresses up the room. …and we’re back to 1960. 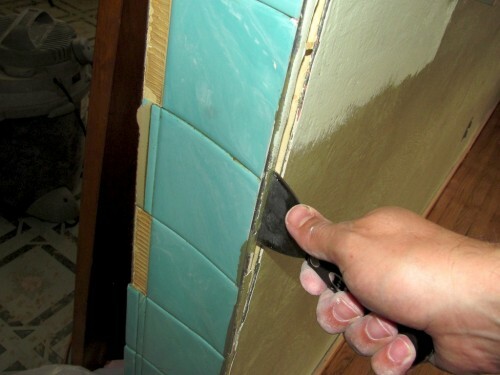 Painting the grout was irritating and sloppy. I need to still go back and touch up the rocks. The rocks are “white clay” and the grout is “chocolate sprinkle”. I don’t choose the colors by the names. 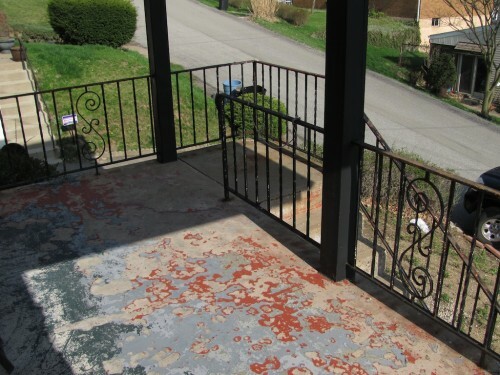 One of the other positive outcomes of my trip to Utah was having TB tell me, without prompting, that Brian P. had tried for weeks to get the many layers of old paint off of his front porch and eventually failed, gave up, and put a whole ‘nother coat of paint on top of it. So I didn’t bother trying to get all the old paint off in the first place. Saved much aggravation. Scraped the railing with wire brush, drill attachment, and putty knife (you can’t see it in the photo, but half of those vertical posts are spirals, which makes fun surfaces to try and get paint off of). Primed (2x), then painted (2x) the railing. Swept, vacuumed, hosed off, then re-vacuumed the concrete. Painted the porch (with concrete paint “for porch and garage floor”). I don’t know how you’re supposed to make a concrete porch look good — or if it’s even possible. 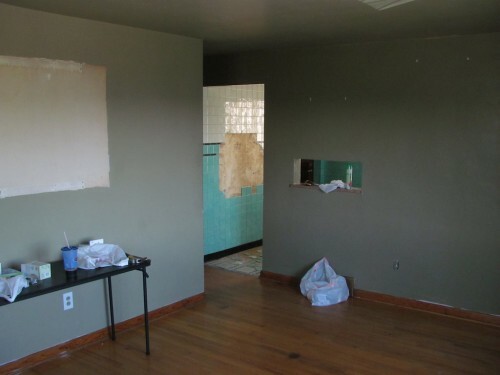 It occurred to me at one point that, if it were a nicer house, maybe tile would be the answer. More to the point, though, if it were a nicer house, I wouldn’t be leaving design decisions like that entirely to someone like me. But it’s a 1958 ranch-style house in a blue-collar, suburban Pittsburgh neighborhood, so I guess I’m good with paint and carpet tiles. I am not going to lie, I have been looking at porch gliders and swings already, I would love one when it is all finished! 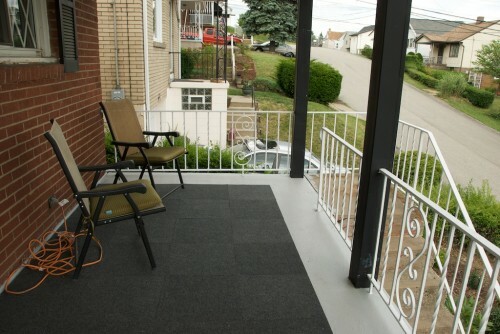 I cannot wait to be able to sit in my porch and soak in the sun! 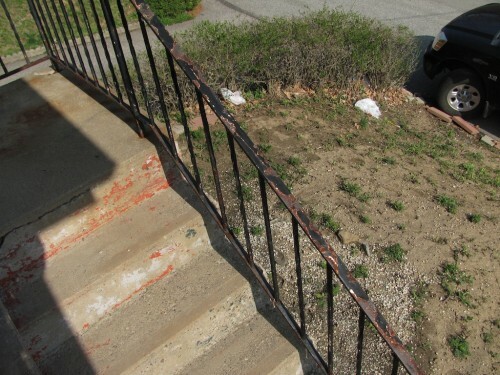 Repair the concrete around the stairs. PS, FWIW the carpet tiles are purportedly “indoor/outdoor”. The reviews (I got them from the HomeDepot Web site) implied that people had successfully used them in fully outdoor applications, so maybe they’ll work out. I may need to care for these tiles using products found at https://www.bissell.com/carpet-and-floor-cleaning-formulas as outdoor carpets take more damage from the natural elements. OTOH, it rains *a lot* in Pgh. Weight: equivalent to three rolls of 1 1/2-inch masking tape, three spiders, and a gnat carcass. 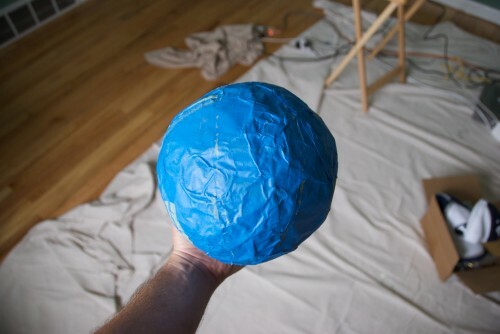 I kind of like sticking random bug bodies into tape balls. Or at least, I prefer it to having the random bug bodies hanging out in the corners of my rooms. Fake fireplace is gone. The wall with the pass-through is going to be half-gone pretty soon. Box of Triscuits also gone. 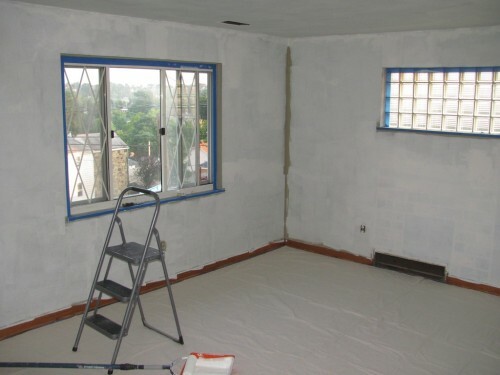 Also painted one of the bedrooms. Check this out! And now I only have, like, everything left to do. 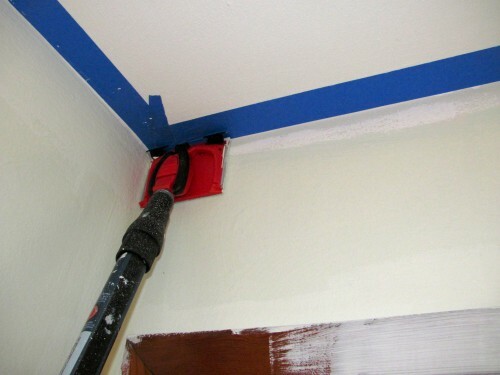 Maybe I’ll post the story about how I managed to get vents on the walls! They should make a video game out of this house renovation. There can be mini game after mini game, each more repetitive than the last. There could also be annoying NPCs. And when you accidentally kill your horse, you can just whistle and another horse will come for you. Just like real life. PS, Market Tavern Green Light. The bedroom. It’s lighter than the living room in real life. More like “bad decisions” than “misfortune”. Or maybe more like “difficult, non-binding decisions that could not be made without investment of time and money”. Something like that. 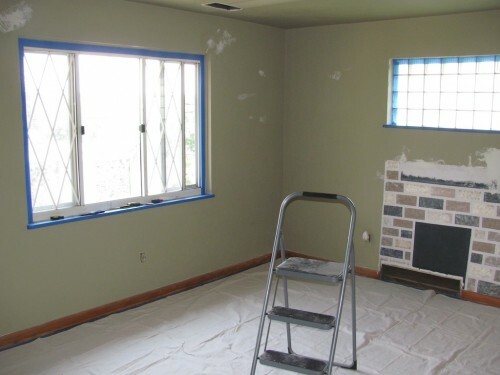 It’s taken too long to paint the three rooms I’m painting and part of the deal has been color decisions. A lot of milk, not much weed. Seemed darker on the card. Waited overnight to pass judgment on it, since, sure, it could dry darker. 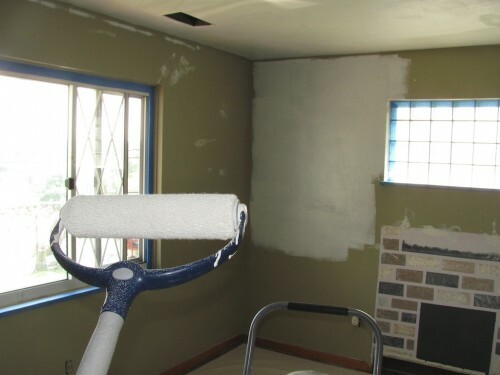 In the morning, went in and, after spraining a cornea trying to differentiate the Milkweed walls from the Ultrapure White ceiling, decided that the walls mostly looked like I’d tried to paint white on top of blue-green and done a really shoddy job of it. At which point I gave up on the Lowe’s colors. Lowes. Whatever. That decided, I went back to thinking I could re-do the New York apartment. 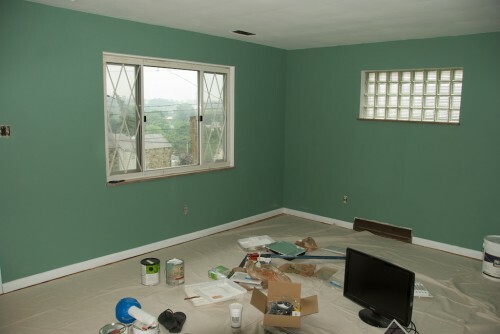 When I’d been unable to find the NYC green on the Behr site (it was called “Lilypad”, may it rest in peace), I’d gone to the Home Depot site and ordered up samples of a bunch of greens that might fit the bill. Those had arrived, and so I painted sample splotches on the kitchen wall that’s gonna get demoed. The colors ranged from circus-like to insulting. Except for one. It was called “Fairway Mist”. Waited overnight for the splotches to dry (yeah, photo would have helped the story, fat lot of good it does for you to say so now), then discovered that Fairway Mist was close, but probably a little too bright. So that evening I went to Home Depot and bought three more buckets: a slightly toned-down version of Fairway Mist (“Peridot”), that color’s lighter cousin (“Spring Morn”), and a color I’d had on the wall in NYC that offers pretty good contrast for images projected on it via my LCD projector (“Silver Screen”). That night I dreamed that I was on Survivor and was the first person voted out of the game. That ego-crushing nightmare brought me to the realization that George Eastman would laugh me out of Rochester if I showed him the colors I was going to use (if only he weren’t dead), which caused me to revert back to Plan A. Drove out to the Special Person store in Castle Shannon (it’s a suburb), which carries the kind of paint that comes in “Colonial Williamsburg” colors. The store is a “Special Person store” in the sense that I think you gotta be pretty special to afford the stuff they have there. $15/sf for slate tile? I’m not that special. Unfortunately, I hadn’t brought the PDF of the brochure (it had been black-and-white anyway), but the helpful helper person at the store went online and printed it off. In real life the colors that looked pretty good on screen looked like crazy Home Depot samples on the color chits. Therefore I enlisted the help of the store person (must be hard to be a woman and have everyone assume you know how to match colors all the time). 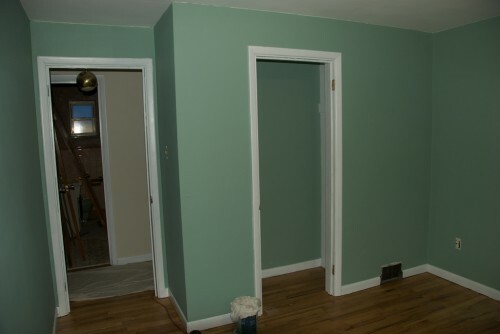 Through serious and sometimes contentious negotiation with her, however, a coherent color palette emerged, consisting of medium (muted) green, lighter (muted) green, medium (muted) blue, and a pleasant bisque color for the narrow hallway. After waiting two hours for them to mix the colors (?! ), I rushed home in a developing rainstorm to finally, finally get some real painting done. Got home, opened up the bisque, and started painting. Eastman would probably refuse to let me even buy film from him if he ever saw *this*. I suppose it should have been a red flag that the color was called “Palace Chambers Yellow Light” — but it didn’t look that yellow on the card. I mean, yellow-*ish*, sure, but it had looked more like the color of a sunlit rope, not, you know, this. Man. Anyway. Even before it dried I was pretty sure I was going to be re-painting the hallway also. That’s about it for the misfortune. I was kind of hoping I’d have built some tension into the story by this point. I should have established some stakes earlier on so that you’d be desperate to read the outcome. OTOH, that’s a little cliche. Tension? Yeah, it’s been done. I don’t need to roll that way. Painting has taken a long time. It will continue to take a long time. Look at the ceiling. 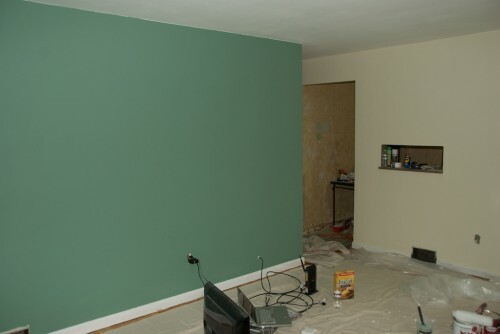 It’s the same color as the walls: olive drab (or thereabouts). 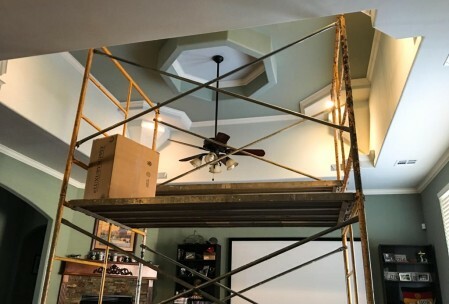 My agent said that the unfortunate part of painting the ceiling the same color as the walls is that it makes the person inside feel like he’s wrapped up in a ball. 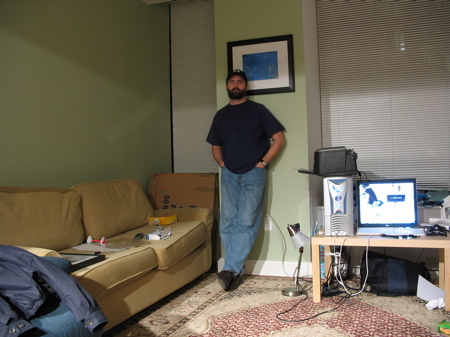 That said, looking back at this photo, the house didn’t look all that bad and I’m confused as to why I’ve torn it up and made it as unlivable as I have. Not really, I remember why. It’s been interesting to observe as work has progressed and the “worst smelling room in the house” title has gone to progressively better-smelling rooms. Currently the stairway is winning (losing?). It smells like dog sweat. And living inside a ball is aesthetically odd. And the photo doesn’t show the five decades of grime on the trim. Or show the odd stains on the walls. Or imply how sticky those surfaces are. Hooray: I have a normal-person ceiling now! The light spot is from light coming through the window. Great, then. I’ve got painted ceilings in the living room, hallway, and “the good bedroom”. I mean, in real-time I have more than that, but I’ll get to that, I guess. I mean, unless you’re watching fishing on TV, I have to imagine you’re following my painting exploits. 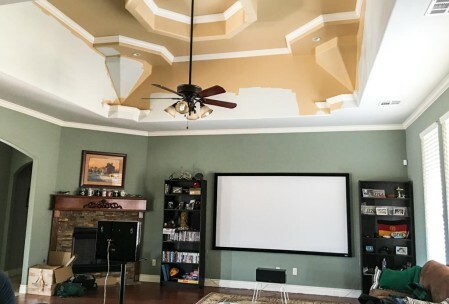 Ceilings -> Walls -> Trim. And remember that it is forever. I’m becoming increasingly incredulous that anything I have posted or will post regarding the renovations of my house has been, will be, or will have been interesting. 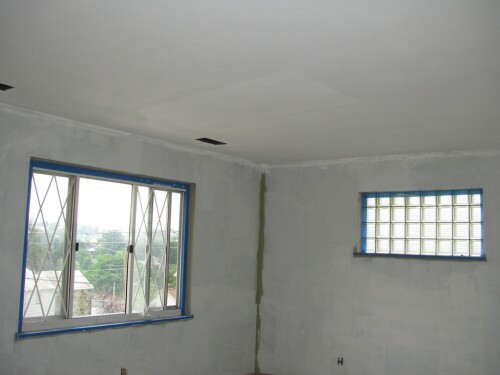 With that in mind, I applied primer to my walls and ceiling prior to painting. That’s right: primer. Kilz is the brand name of the primer. It seals in stains and odors and whatever else is stuck to the wall, including (I hope) spiders. The wall really soaks the stuff up. Interesting? The roller is coming. Beware the roller. The step ladder did not move. It is an optical illusion. 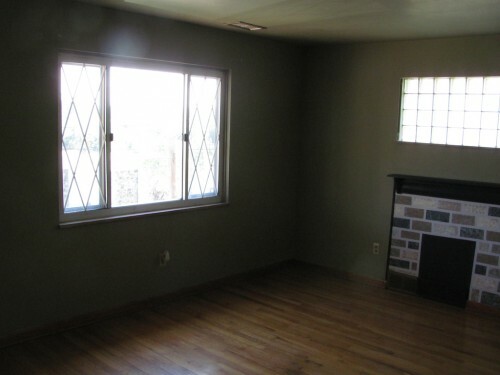 If you try hard enough, you can still see the fake fireplace. For now. And I’d have uploaded a better “before” photo, but that would’ve been on my other computer, which is on the bed. 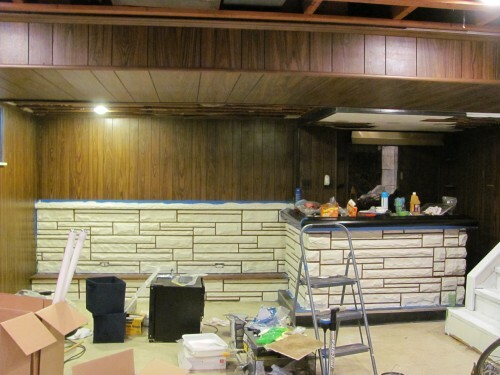 Clearly, then, a better “before” photo is (and will remain) out of the question. Up next, the excitement level skyrockets as I start painting the ceiling. Pregnant women and readers with heart conditions are advised to avoid my blog for the remainder of the week. Painting preparation, the great American pastime. Because the cat urine stench alone wasn’t enough to peel paint off the walls. It’s a metal thing nailed into the drywall that kept the tiles in. 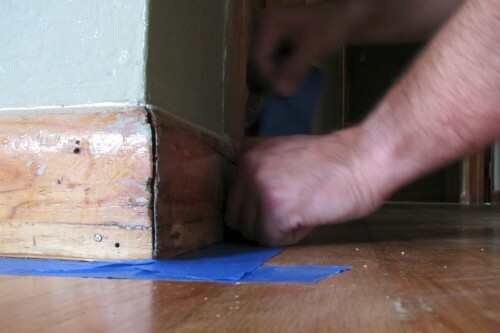 Hadn’t realized my baseboards were this ugly. The dropping of cloth is complete. Lacks drama. Not edgy enough. It’s 7:12 in the morning right now. There was some other stuff not pictured. Like that one glass brick window had a couple of wood things screwed into the window box that didn’t want to come out because the screws’ heads were stripped. Had to pull them off their screws and then unscrew them with pliers. Now *that* was drama. Not really. It was pretty normal. 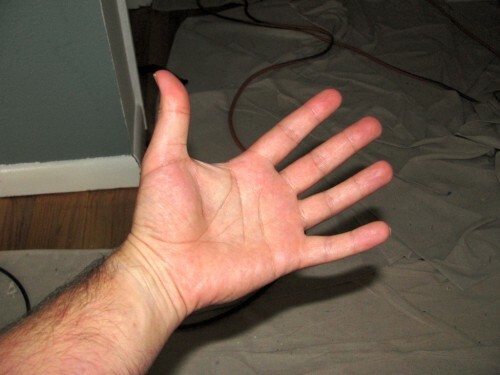 I’m just glad I didn’t put another gash in the drywall. 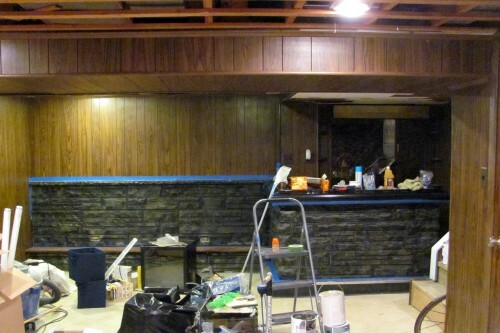 Speaking of gashes, there was a pretty good-sized hole in the wall above the fake fireplace. I tried putting one of those pre-fabricated patches on it, but the metal thing on the patch was really thick and made the patch too obvious. 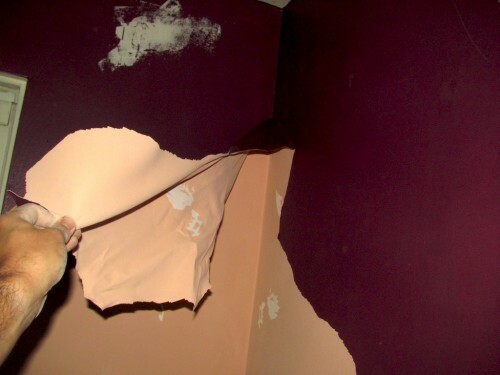 So I pulled it off and just put drywall tape over the hole and mudded over that drywall tape. I’m guessing it’s less likely to stand the test of time this way, but it definitely looks better. Worst case, I have to re-patch it and re-paint it some time in the future, but so long as that future date is after Labor Day, that’ll be fine. 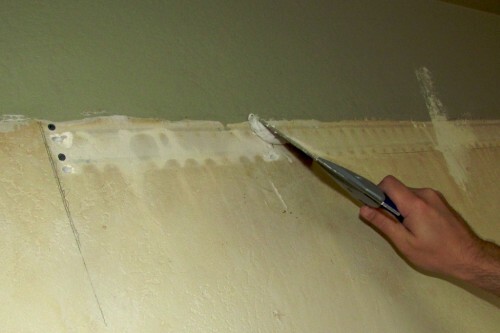 Right now I just want to get stuff done and move on and in the meantime hopefully none of my house guests decide to probe the living room walls for soft spots. 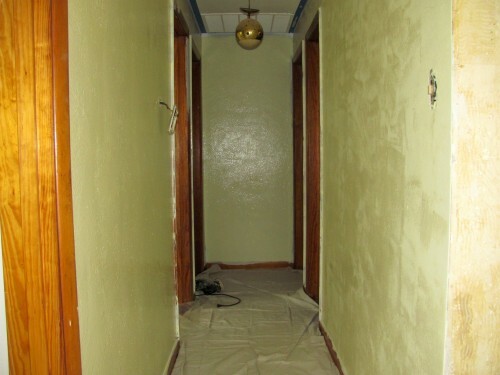 The paint in the one bedroom and in the hallway came off in sheets as pictured. Kind of disturbing. And once that paint was off, the wall behind it smelled like cigarette smoke. Drop cloths worked better than hoped. It turns out that the two big drop cloths I got each had one of their two dimensions perfectly in sync with one of the two dimensions of one of the two rooms they were used in. So it was a pretty good fit. FWIW, I’m only working on the living room, hallway, and one of the bedrooms right now. I need to get some window coverings so I don’t have to wake up at sunrise every morning. 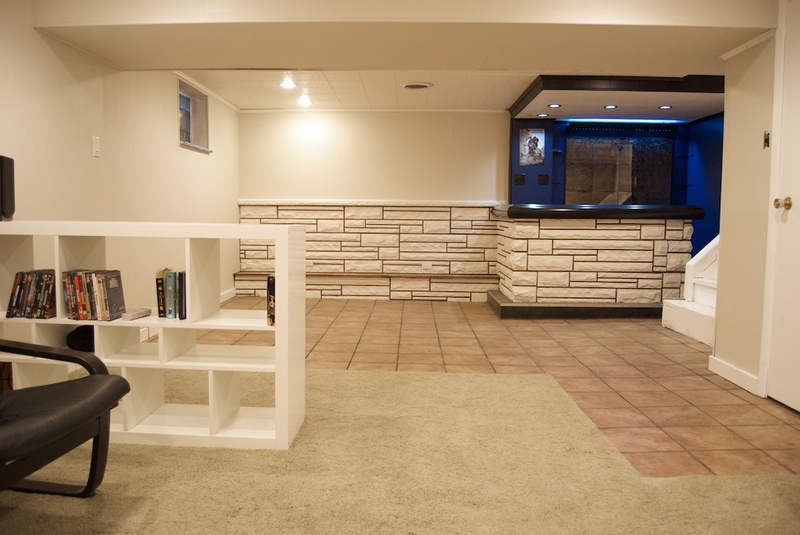 PS, WIll eventually do a floor re-finishing post-mortem, but all the “before” photos are on the laptop and the laptop is in a place called “Cranberry Township” right now. It sounds like a place where the street signs are slathered in gumdrops, but it’s not. It’s just a place. Might be a few days still for the post-mortem though.